This Vista wallpaper has a dark feel to it but at the same time if you could only make it to the manor then everything would be okay. 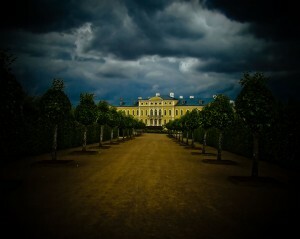 I like the rows of trees that lead to the building and the dark clouds above. The path to the manor looks so manicured and the manor itself looks stunning. Great pic.